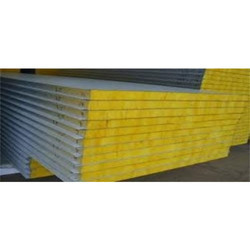 We are manufacturers, suppliers & exporters of an extensive range of PUF Insulated Panels, PUF Panels, PUF Sandwich Panels, PU panels, Jindal PUF Panels, which are suited for applications such as, cold storages, pack houses, CA chambers, banana ripening chambers, freezer rooms. Our PUF Panels are manufactured in a computerized plant and come in pre-painted galvanized steel sheets (PPGS) and stainless steel fascias. Our Puf Panels are of high quality & meeting industry standards. We are addressed as an eminent and reputed PU Panel manufacturer and exporter in India. Our products are known for their several qualities like damp resistant, high strength, stable performance, easy to install, etc. Our company devotes immense attention towards the kind of material used in the production of our offered range. Therefore, our products have a long service life. It is widely used as the wall or roof for cold storage, public building, industrial workshop, etc. Our offered polyurethane panel price has been kept low and is known for is popular for its fire-proof and sound-proof nature. Wall Panels: 40 mm, 50 mm, 60 mm, 80 mm, 100 mm, 120 mm, 150 mm. 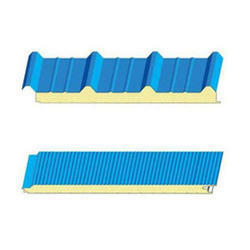 Roof Panels: 30 mm, 40 mm, 50 mm, 60 mm, 80 mm, 100 mm, 120 mm, 150 mm. In this field we are recognized amongst trusted Manufacturers, traders and Suppliers of the qualitative range of Sandwich PUF Panels. Offered panels are exclusively manufactured using optimum quality raw material and modern technology in adherence to the set industry standards. Owing to their specific usage in various industries for roofing purposes, these panels are widely demanded among our clients. Further, in order to ensure the best quality, the provided panels are strictly tested by our experienced quality controllers on various quality parameters. 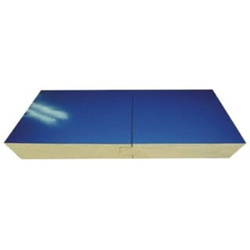 With rich industry experience, we offer a wide range of PUF Sandwich Panels. These are manufactured in line with the set industry norms, using supreme class materials and the progressive materials. Equipped with high strength materials that provide manual option facility, these are available in diverse specifications as per the specific needs of our clients. These are used for making cabins and are available at nominal rates. 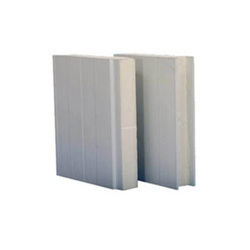 Leveraging on our vast industry experience, we are providing our clients a wide range of Metecno PUF Panel. Manufactured using supreme grade materials as per the set industry standards, this is available in diverse specifications as per the specific needs of our clients. Widely appreciated for characteristics like light weight, less maintenance and acid resistance, this is used for making portable cabins. Furthermore, our clients can avail this from us at market leading rates.